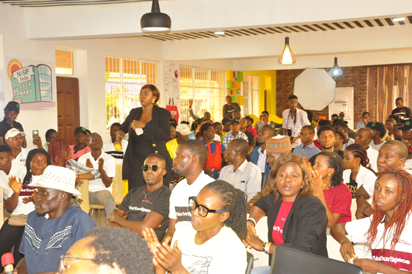 Not less than 500 youths in Edo State converged at the Edo Innovates Hub to engage policymakers and development experts on approaches to mainstreaming young people in development as well as deploying technology in solving social and economic problems. Musician, Aituaje Iruobe, popularly known as Waje, addressing youths during the Open Space for Youth event, organised to mark the 2018 International Youth Day, at the Edo Innovation Hub in Benin City, Edo State. The event tagged Safe Spaces for Youths, was organised by the State government in partnership with Oxfam, a non-governmental organisation, to mark the 2018 International Youths Day, at the Edo Innovation Hub, in Benin City. Senior Special Assistant to the Governor on Skills Development and Jobs Creation, Mrs. Ukinebo Dare, said that the event was packaged to give youths the opportunity to engage policymakers, youth icons and development partners, on their peculiar challenges so that government can serve them better. Project Lead/Small and Medium Enterprise (SME) Programme Coordinator, Oxfam, Mr. Michael Adeola, said that the collaboration to organise the event is built on the fact that the state has a progressive approach to youth development. He said that Edo State was chosen for the event because of the progressive approach of the state government in putting young people on their priority list, adding that youths at the event have engaged with policymakers and decisionmakers expressed the challenges they face. Musician, Aituaje Iruobe, popularly known as Waje, said that the African continent is 60 to 70 percent young and hence setting the right foundation for young people to thrive in business is important, because that is the only way to grow. “I think it is a nice initiative to have this young people here as we are celebrating the International Youth Day. I also think that it won’t just be all talk, but that they would be inspired to solve challenges. This will ensure that they do more with what they get from the system,” she said. Aigbovo Victor, a Tony Elumelu Foundation awardee, hailed the governor’s strides with EdoJobs, and how he is opening up space for youths to express themselves and contribute to development.